I hope you do kill him off! I wish women were not written so stupid. I can tell you if an angel told me not to do something I sure as heck wouldn't! When is the book coming out? I can not find the release date. Thanks. I loved the teaser! I can't wait! Thank you for sharing. i cant waitt! i loved itt! thankyouu for the teaser! Loved it!!!! I can't wait to read incendiary!! From the teaser I know it's gonna be GREAT!!! So so so excited!!!!!!!! Do we get a date? Thank you so much for the teaser and I am dying to read incerendiary! Awesome teaser! Oh, I just can't wait! So many good books coming out all at once makes the lonely deployment nights go by faster. Loved the teased..cant wait for the book:) I hope its soon...date????? I can not wait for the book! It looks like its going to be amazing like the others:) I'm so excited! Oh Wow! Amy I am so thrilled you shared. Thank you. This just makes me more excited about the release. Thanks so much Amy!!!! I am so excited! Congrats on your awards this past weekend. Thank you,Thank you,Thank you,Thank you so much for the teaser, I can't wait for incendiary to come out, please come to new York City to sign my copy! Love the Song ARMS...and this Teaser omg loved it and cant wait to read the whole book!! Awesome!!! I so can't wait. ;0) Thank you for sharing. OMG! OMG! OMG!..... That is one heck of a teaser. I LOVE how much Reed & Evie love each other. I SERIOUSLY CAN'T WAIT FOR INCENDIARY. WOW! I cannot wait for the book. I have reread the series twice and was starting to have Reed withdrawal. Thank you for the teaser. Let me just say, I can't quit smiling after reading the teaser! Thank you. As always, thank you for the updates on the progress of Incendiary and CONGRATULATIONS on the awards that you won at UTOP-YA! They are well-deserved. I'm also really enjoying all of the pins on "Reckless Thoughts Abide..." and the Premonitions series boards on Pinterest! More please!! Can't wait! Congrats on your success! I am too freaking excited!! BEST TEASER EVER!!!!!! I love your books, I have read them like five times each!! This is one of my altime favorite series!!! Thank you for the teaser!! You are one of the best authors EVER!!!!!! That song is perfectly Evie. And I have a love hate relationship with teasers. I usually do not read them at the end of books. If I dont have the rest of the book I get agitated. But I couldn't help reading this one. :s I loved it, of course. Lol I am almost done rereading the books. Half way through Indebted. So I am really gonna need Incendiary soon. :) No pressure! I know how life can take over your life. Haha. Anyway, I think I can speak for all of your fans when I say "I CANT WAIT...SOOO EXCITED!!!!!" Thanks for being you and creating these characters, I am in love with them. I have some issues, I think. ;) I have problems being in my world when I'm reading about Angels. Oh my gosh I am just hooked now!!! (Not that I wasn't before lol). Oh and dito Viictoria W. I definitely fantasize about Brennus way to much for it to be normal. I've come to the conclusion I too have issues haha. 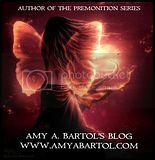 Oh and to Amy Bartol- I really appreciate all the blog updates, book signings, and events you do. Oh especially the music videos you post. I've had a few ideas for music regarding this series aswell (I think paralyzer by finger eleven is a good way to describe how every male feels when they see Evie lol). Your dedication to your fans is really great. Not a lot of authors would take the time to do this. OMG..........So excited. I can hardly sleep. I have read the series twice. I just cant get enough of Evie and Reed!!!!! When will the next book be out????? These are the best book series ever!!!! So so super excited!!! I think brownie and Russell need to end up together in one of you books its killing me that they are the only two not hooked up. Please throw us a curve ball and put them together soon its killing me. Can't wait for the next book! I flew by the teaser because I need to experience it all at once! Awesome!!!! I can't wait till it comes out!!!! I'm definitely Team Reed!!!! Best Teaser Ever!!!!!!! I debated whether to read it, but in the end I couldn't help myself. The characters you've created have imbedded themselves in my soul...I swear!!!! I too, like some of the other fans, get so caught up in your writing, the world around me gets in the way! UR Awesome!!! Congrats on your awards...I had no doubt you'd win! Thanks for being so dedicated to your fans...we'll always stick by you!! So excited for Incendiary! TEAM REED!!!!! I am getting so excited about Incendiary. I can not wait for it to come out. I really enjoyed the teaser, you did a great job not giving to much away. I look forward to reading the book as soon as I comes out. In the mean time I am going to get some work done myself and I think I am going to re-read all of your books again. Thanks for being such an awesome author Amy. I'm not the least bit surprised by the awards you've won. You definitely deserved them. Your characters are like friends to me now, and look forward to reading about them again soon, I hope. So happy that you've met people that will help further your success!! Thanks again for sharing your talent of writing with us. Thanks for the teaser and "Arms" great song choice! Downloading it to my "Premonition song list" now. I am dying to read this book! I agree that Russ needs to get hooked up with someone. Please get him a girl fast! omg!!! thank you so much i have butterflies i loved it, totally made my day. cant wait for it to come out. if u have any more teasers they are welcome. CAN NOT WAIT!!! Read all 3 twice and the anticioation is killing me! Also LOVE all the songs u post while writing. Ok I am dying here waiting for this book to be published. I have refused to read the teaser for the past four days, but finally gave in today. Now I just want the book here faster! I am so hopelessly addicted to Reed and Evie...and Zee! I am dying with anticipation for the 4th book! I really hope she brings Tau into the story. Thanks for the teaser! I love this series and can't wait! LOVED IT!!!! CANT WAIT FOR IT TO BE ON SALE!!! thank you for the teaser!! Hello!!!! What a nice way to end a lunch break at work.....:) Can't wait for the book. Thanks for that teaser. the wait is unbearable. I've read all the books like probably every week. They are generally the first books I look for on my kindle. Thanks for Evie and Reed. AAAHH! I can't wait. I mean, I would wait, in line, all night, in the freezing cold-- just to be one of the first to read the rest--AND I always thought people who did that were crazy. I just wanted to tell you that you're AMAZING! You totally deserve every prize and recognition for your work! At first i was hoping for a teaser ready to devour it like i do with everything else you write, but now that it is here i just can't read it!!! Whats wrong with me!? Can't wait for the next book. I know it will be as amazing as the last three maybe even more. Congrats on winning those awards not for a second did i think you wouldn't get them. Your writing is amazing and you work super hard, if anyone deserved an award it would be you. This song must have been written for this series! Amazing! I wish they would make this into a tv series because this series is so awesome! Can't wait for the next book...Please hurry. Do you have a date when you plan to release it. I can't wait. I call the book store daily. Will it be out in kindle before? I seriously REALLY need Russell to fall in love with someone else. And if you can make it believable, brownie points to you! I can't abide this love triangle...octagon...whatever...for much longer! Ok seriously DYING OVER HERE!!! Puhhhleeeeese hurry and finish!!!! I've recommended the series to everyone I know and now they're all foaming at the mouth for Incendiary!! We can't take it amymore! How long after you submit for publishing until we get an actual release date?! And someone PLEASE tell me they are making a MOVIE out of the series! It would BLOW Twilight amd the others out of the water! I agree with you sarah! seriously when twlight came out it was great, but then EVERYBODY was writing, acting and talking like or about vampires. This seris is so refreshing, if people would read these books, it would soooo blow up like Twlight did. I cant wait for this book to come out! I'm a 27 year old stay at home mom of 3 boys and I cant get enough of this series. I read the first 3 in 4 days......I'm hooked on Evie and Russell's soul mate connection. I will be checking back frequently to see when the release date is!! I am going totally crazy over this series. I need Incendiary to be finished soon. I am about to read the series all over again for the fourth time..... Team Reed and Evie!!! Please, please, please hurry with a release date :) You are awesome Amy!!!!!! You are such an awesome writer! I'm so excited and can't wait to read Incendiary. I know it will be amazing. I hate to admit it but I started liking Brennus. I do not know who I want her to be with because I also love Reed and Russell so I am so anxious to find out how this all ends. Thank you for the teaser - I didn't read it all, because I want to save it for when I can read the entire book. I love this series, although I wish I had know there were 4 books before beginning it - I believe I would have waited until they were all released before starting. I have read a few other similar series since this one (one of which had extremely horrible editing) and I almost feel as if I need to re-read in order to sync back into this story line. Please hurry, but don't rush through the editing... great series. I can't wait for this book!! I am reading the series all over again because it is so good. Reed and Evie are like MAGIC together! Thank you writing this series! SOOO excited for you (and for me)! The teaser has me sitting on the edge of my seat and biting my fake nails! You are a rockstar! BTW, I love the Christina Perri song. I just added it to my Ipod. I am off to eat some Dorritos and listen to music. I love you! Thank you so much for the teaser.. i am so excited to get the new book and read it on my kindle. I have to say this is a great series so far and i am so excited to read the next book.. Yay.. Cant wait!.. Thanx again for the teaser!!!!!!!! I love the song! I keep listening to it and it is definitely Evie! I loved the teaser but...... it makes me want to read the book so much more and I am dying for it to come out!!! Any more news on when?????? Thanks so much for the teaser and thank you for being such an amazing writer! I am completely wrapped up in the world you have created to the point that I just finished the third book and it's 4:30 in the morning my eyes are heavy, but I am still hyped up off your books. My heart was pounding so many times in the book that by then end I felt like I had just hopped off a rollercoaster! Gracious! Can't wait for the next one! Allll-right. This is getting crazy. I check this site every day, seeing if the book has been published. I am IN LOVE with these books, I can't wait any longer. Amy, please, put me out of my misery and get it out there! These books are like the Gancanagh touch, I'm hooked! I have to tell you.... I could not put the series down! & Already, I am done with books 1-3 ... Reading is my only escape from my constant crazy life.... It heals me in ways I never thought possible! Anyway! I'm so on the edge of my seat waiting on book 4... I'm sure you don't need me to tell you this... but you totally ROCK! I'm hooked! I will check back daily until the book is avaliable! Come on Amy...it's time! We need book 4. Oh...and then I will need book 5 so I'm hoping that the characters are still talking and keeping you up at night! ;) You have a wonderful gift. Thank you for this series. It's truly beautiful. Amy i feel like i am being tortured here..dying for incendiary to come out im ready to start pulling hair at this point. Luv u by the way! I have torn through these books in the past two days I haven't even caught up on sleep. I am truly a big fan and thankful I have discovered these wonderful books this summer. Thanks to you I have avoided a boring summer. Its so hard to wait for the fourth book I just finished Indebted a few minutes ago sadly. I couldn't hold myself back from reading the teasers no matter how hard I tried. Thanks so much for these wonder books. You have found such a great way to mix all of these elements together in a book. Evie is the perfect heroine she isnt annoying like other heroines she's strong and witty. My heart breaks a little bit more each day I come to this site and see the same old post. I am utterly and forever will be obsessed with this series. I cant tell you how many times I have read each book and my experience with them is like reading it for the first time. & I will stay passionatly waiting for the release date.